1) Practice your serve. The only shot in the entire game that’s completely under your control is the serve. Think about it. All other shots flying to your side of the court originate from your opponent’s racquet. The lesson: practice your serve. Very few do. They swing backhands and volleys but rarely spend quality minutes on that toss and serve. 2) Run Around Your Forehand. Most of us have a “weapon.” To many, it’s the forehand, and rightfully so. It’s the more natural shot that offers plenty of power. 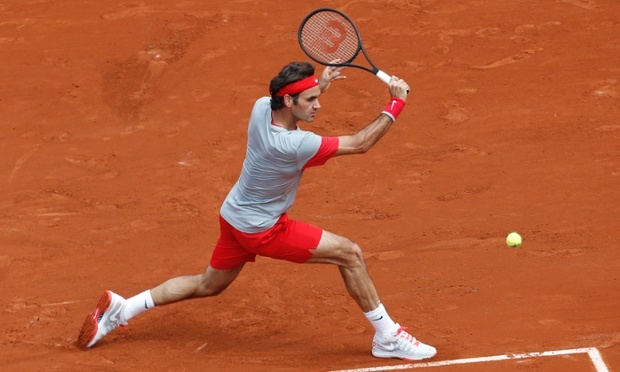 Develop a Federer-like attitude, one where you can hide your weakness (backhand) by attacking with your forehand. 3) Play with better players. This sounds obvious but we often neglect it. How often are we afraid to challenge, if you’re Class B, a Class A netter? Go ahead. If you stick on playing with those who are in your caliber (or those not as good as you), it will be them who’ll improve. The way to advance is to play with better players. 4) Slide. If you play on clay, like in Roland Garros, you’ve got to learn to do this. It’s the fastest way to get to the farthest shot. Glide like Novak. 5) Rally. I know many of us jump straight into playing a singles or doubles match. It’s fun. Your friends are waiting. And don’t we all want to compete? Right. But if you really want to improve, you’ve got to step away from “competing.” You need to rally. By rallying, I mean doing nothing for 45 minutes but trading shots with a trainer. Focus on a specific shot and practice that single shot 109 times. Take time off matches and rally with a coach/trainer. 6) In Doubles, keep a high first serve percentage. It’s not important to serve like John Isner. What’s more important is to put more first serves into play. Why? Because the opponent knows that you’ll have a weaker second serve and he/she will pound on it. Better to have a 3/4-speed serve which goes in than a 202-kph serve that hits the net. 7) Try different racquets, strings, tension. Like Federer, who recently shifted to a bigger piece of equipment, you should try the same. I know change is difficult, but it can improve your game. The best advice on new equipment? Try it out first from friends. Don’t buy the latest Babolat AeroPro without sampling it for 15 minutes. Also, try new strings and a new tension. If you want more power, lessen the string tension. You want more control, increase it. Experiment. 8) Videotape yourself. I know this is extreme but the best coaches do this to their pupils. Only after you’ve watched yourself in real action can you visually know what changes are needed. Use your iPhone. Play it in Slow-mo. Golf pros do this. Jana’s coach, Tommy Frederiksen, does this. It helps. 9) Spin your 2nd serve. Many of us smother that first serve and, when we miss, we flick our wrist for that super-slow second serve. I think it was Pete Sampras who once said, “You’re only as good as your second serve.” Develop an excellent 2nd serve by adding spin. The kick (American-twist) serve is best. 10) Mimic your favorite player. I recall, back in the 1980s when I first started to play at the then-Cebu Tennis Club, how I improved best: I copied. I’d watch Ivan Lendl’s matches (he was my idol) and I’d copy his wicked forehand. I’d turn my shoulders, pull that right arm back, point the elbow outwards, then fire that bullet forehand. Who, if you were to ask me, would I recommend that you follow, among today’s men’s players? According to strokes and based on who possesses the best mechanics, the undisputed winner is Roger Federer. Every single shot that he executes looks perfect. 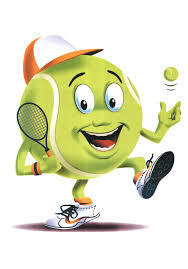 His serve is classic and no-frills with a very relaxed motion. His forehand is one of history’s best. 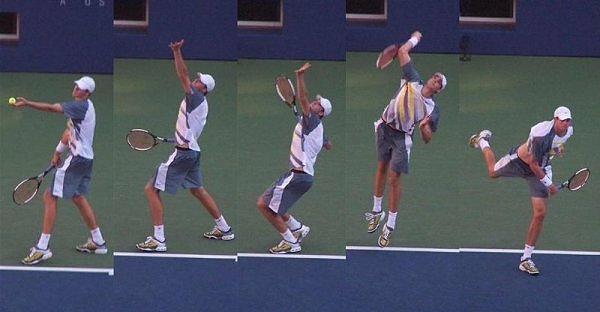 Volleys, smash, slice backhand — everything. Follow Fed. If you’ve produced 17 Grand Slam titles and two sets of twins, then you must be truly gifted.